We had a big 20 hour mystery at our house, that was just solved. In reverse chronological order, here is what happened. 5:00 pm: Mystery Solved, confirmed via txt. 8:00 am: Asked Luke for confirmation that my hunch was right. He did not know what I was talking about. 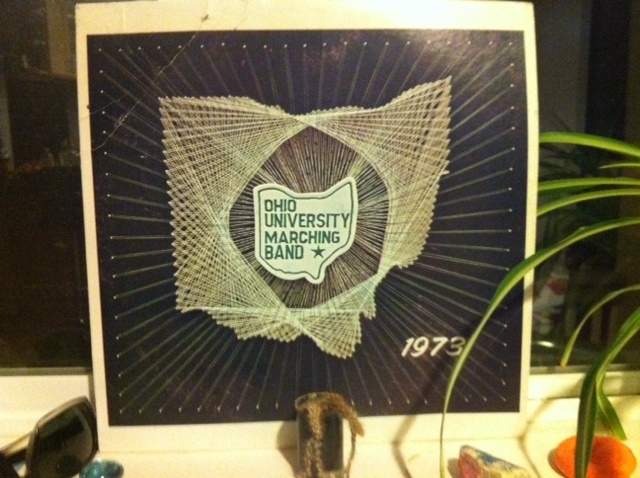 11:50 pm: Posted a picture on facebook of the 1973 Ohio University Marching Men marching band record album that was the center of the mystery. Stated that someone had snuck into my house and left it on the windowsill. 9:06 pm: Speculated wildly about who left the album. And by “wildly” I mean, I assumed it was my friend Rob since he’s the only person I know that listens to records. 9:00 pm: Noticed the album on the windowsill! 8:55 pm: Half-heartedly cleaned the kitchen, heartily mixed drinks. 8:50 pm: Lost a race to our house, to our friends who drove. Found them sitting at the kitchen counter having a drink. This entry was posted in Uncategorized on November 12, 2011 by metamegan.